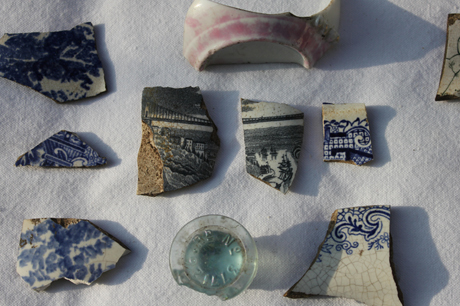 As I dug around in the soil I found many pottery fragments – remnants from a people living, loving and being in Snap. 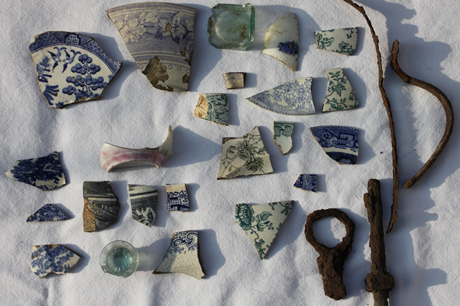 Some pieces had been cups, some plates, perhaps a few chunky chamber pots and even a delicate glass top – a perfume bottle? None look precious but they excite me and capture my imagination with the humble story they hold. I had another opportunity to visit Snap for a little more detective work a few weeks ago. Sometimes you visit a friend and have a moment of serendipity – she confessed she owned a metal detector. I confessed I had always wanted to use one so she lent it to me and I had a glorious time searching in Snap for metal. 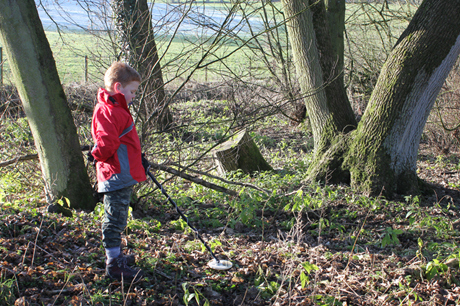 My son hoped for treasure, I had plans to find a few coins and though all we managed to find were scraps and a door handle, it was deeply satisfying to fulfil a dream. I now have pieces of Snap and want to create an art work incorporating these fragments. I have done one piece using a similar idea called ‘Walking Home’ but I am planning to use more pottery pieces in this art work. However, I’m also working on another art project so I may have to hold off for a while and let my ideas continue to bubble. To read more about Snap go to www.abandonedcommunities.co.uk. I visited Snap for the first time in December 2011 to explore and satisfy my curiosity. There isn’t much to see and if I didn’t know it was there, I would have walked right past. 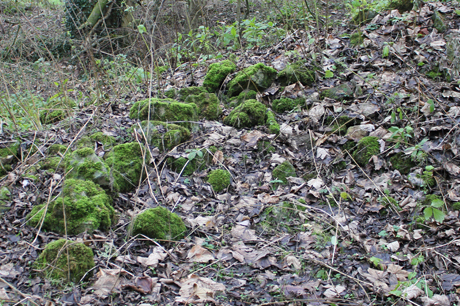 Trees have grown over the site and the area was used for military training in World War One which hastened its dereliction – we clearly saw what could only be a bomb crater while walking down the lane. Many of the cottages have also been plundered for building materials. 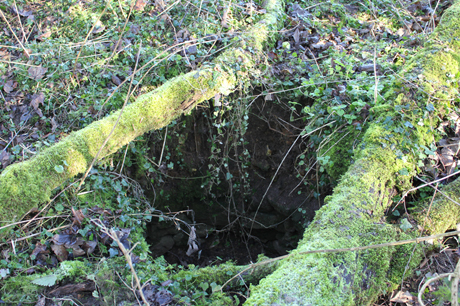 On my second visit in January I discovered the old well and also the stone bollard. 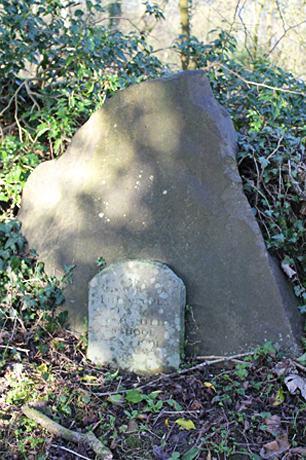 This had been placed to protect a cottage that was built close to the lane from passing traffic. It made me smile sadly as the cottage is long gone but the bollard remains. Defunct of its original duty, it has a worthier function of commemorating an entire village. The hamlet was always too small for a church so there are no gravestones but green snowdrop stalks pierce through the dead leaves as a reminder of the former gardens. I started to dig. I have three projects that I would like to work on this year. I am working on two concurrently and I only have time to do a little each week but I am finding them most inspiring. I thought I would introduce Project 1: Snap Village. Background: Snap is a lost village on the Ridgeway in Wiltshire and captured my imagination immediately. Half remembered truths, lost legends, history and letters, fragments from the past grip and fascinate me. For over four centuries the population of this hamlet remained at about 40 to 50 people but in the late 1800s major changes in agriculture meant that the employment on the local farms was drying up. In 1905 the two farms in the area were bought and converted from arable to sheep farming which deprived the villagers of their work and six of the seven cottages were abandoned. The villagers had no choice but to move away, apart from an elderly couple who remained for a few more years. The last two people living in Snap were James and Rachel Fisher. In 1909 after her husband had died, Rachel aged about 84 was persuaded to move to nearby Aldbourne. A tiny little community and hamlet was finally lost forever.